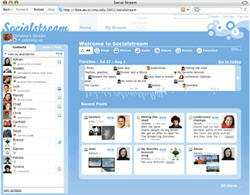 User Tommaso on #Lifestream let me know about an interesting project called Socialstream. It was the result of a Google-sponsored capstone project in the Master’s program at Carnegie Mellon University’s Human-Computer Interaction Institute. It was initially planned as a way to improve Orkut which is Google’s home grown social network but it went beyond just simple funtionality changes and UI improvements. Aggregated Social Content – Presenting all of a person’s social content in a single site makes it easier for users to keep up-to-date with their contacts by making the process of finding information takes less effort and time. With Socialstream, users no longer have to jump from site to site just to see if or what their contacts have been up to, since all information is easily accessible from a single location. After reading through the project pages this looks to be a very well thought out and impressive looking service. It appears to really be striving to not only allow users to create Lifestreams, but adds functionality to create a social network based on them for all users within to share their presence with each other. Im really looking forward to this one and hope that it becomes available to us at some point soon. This project illuminated my realization that one thing I’m starting to notice. As we get flooded with more Lifestreaming services there is a need for one of them to gain dominance if a social network is to be built around them. For many of us, not only do we want a full featured Lifestream with all our aggregated services, but we want all our friends’ Lifestreams to be just as easily accessible on that same service. The same issues that prompted the Lifestream concept to be created in the first place, will repeat if such a service doesn’t emerge. A similar situation is starting to happen with the battle for micro-blogging services. Twitter, Jaiku and Pownce are now in a duel to see who will become king. Having a winner is pretty important as following your friends and posting to all 3 services is cumbersome. Although similar, for me, the use of any one of these is just a service component that make up my Lifestream definition. If you follow my Lifestream, it doesn’t matter which one of them I use and vice versa if I monitor your Lifestream. For now, I primarily use Twitter and feed that content into Jaiku. That’s the beauty of Lifestreams, you can choose any services within specific areas to make one up. facebook is the dominating social aggregator. The noise and actions that lead to convergence is heating up fast. Just consider the last thirty days of announcements: Google, Facebook, Linkedin, MSN, IBM and others ( I can hardly keep up anymore). Soon it won’t matter which existing network “you” think is better rather value will be created by how you manage “your network”. As more and more closed systems open, it begins to interact more directly with other existing systems, and therefore acquires all the value of those systems. Soon we will all be overwhelmed with an abundance of value proposition in which you’ll need to decide how and what to use in “your” network to meet your personal and professional aims. You will soon become your own aggregator of networks, of relationships, of information, of knowledge and last but not least…of VALUE. Technology provides the means, relationships provide the value. The Relationship Economy is now, not when, being built by individuals who learn how to maximize the value of relationships by optimizing technology. We’ll need to forget what we’ve been using and think “how” to adapt to the convergence of means which enables us to maximize value. We need to ReThink our methods and ReShape the means so we can individually and collectively capture the most value. Are you ready? What is your plan? How will you adapt? When is Now: What say you? I say me, warning that site has an animated favicon. Right now, what we don’t need are yet more social networks, whether they aggregate other networks or not. What we do need is some way of managing the ones that we’re already signed up to. Something that’ll manage our profiles that all other social networks will support. Yes, there’s always FOAF, but it’s pretty weak and doesn’t offer all of the Alpha Geek / enterprise-ready security hooks & straps to keep our mobile profiles our own.